I’ve wanted to do a blog post for a while that explained some of how I made Whatever Quilt. I began and completed this quilt in 2016. I entered it into QuiltCon 2017, where it won first place in the Small Quilts category in Savannah, Georgia. I love this quilt so much, and it feels really great when other people love and appreciate it too (not that I need the validation, but it does feel really good)! Please let me know if you have any other questions about this quilt, and I will try to answer them! I got the idea of Whatever quilt from something I designed in 2014. It was a lettered quote that I made to remind myself “you can do whatever you want”. It’s easy to get caught up in self-doubt and that makes it hard to make decisions. Knowing you are in control and are capable can help push through some of those negative thought patterns. You can see from this series of images how the design changed, and didn’t change, through the process. I made a lot of the final decisions after I brought the sketch into Adobe Illustrator. Some decisions were based on overall design composition, and others were based on what I thought I could piece and construct well. For example, I had a hard time deciding on how to create the scallops on the bottom – how to sew them and make them look good, and how to attach them to the quilt. It was becoming too complicated for me, and I decided the overall design didn’t need them. Using Illustrator was a great tool for me (I’m not sure I could have made Whatever without it). It let me easily play with the overall size and colors of each piece; and when it came time to actually make the quilt, made it easy to create templates with accurate seam allowances. 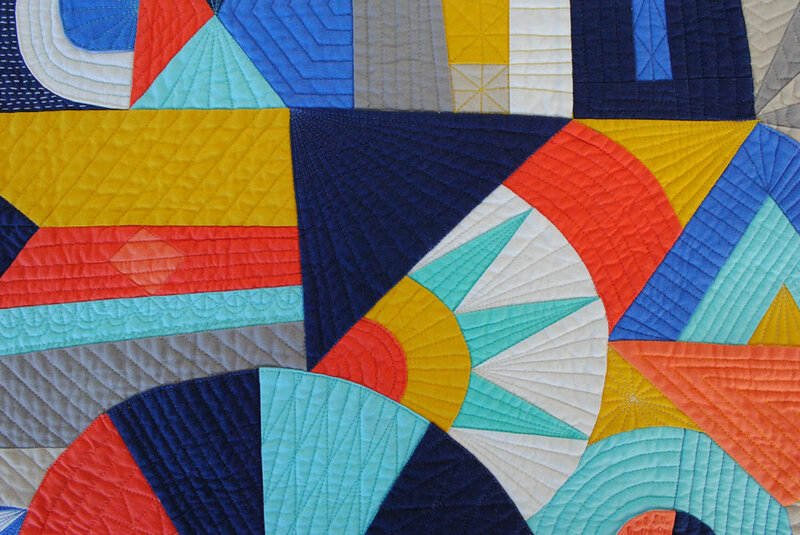 Whatever quilt was made with a variety of different techniques – nothing was off limits! There is a combination of piecing (with templates), paper piecing and applique. I didn’t really consider how it was all going to get sewn together until after the design was done. I didn’t want to limit myself, and I knew that I had enough experience to be able to eventually figure out how it could all go together. I started by grouping things together into “blocks” and then figuring out where I needed seams and how each piece would actually join together. Then I created the templates and added the proper seam allowance and printed each piece to scale. None of this was improvised – everything was planned out very thoroughly before I began sewing (my brain just works better this way, and involves less stress for me in the end). I usually try to stick to one brand of fabric when working with solids, but the most important part is finding the right color. So, for this quilt I used a combination of Robert Kaufman - Kona, Michael Miller – Cotton Couture and Paintbrush Studio solids. I knew while I was designing Whatever that I wanted a combination of machine quilting and hand quilting to add more dimension and texture. I didn’t decide on the final quilting designs until after it was all pieced together. I sometimes sketched ideas on paper, or used tracing paper on top of the quilt to play with different options. If you haven’t been able to see Whatever quilt in person, I hope these up-close photos will help show some of the detail of the piecing and quilting!